I have just begun a new series of sketches and illustrations depicting my surroundings in Paris’ fourteenth arrondissement. To a certain extent, it is a follow-up on what I used to do 10 years ago in London when I was living in Brook Mews North. 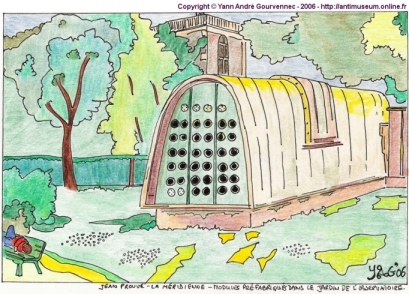 The latest picture from that series is the one depicting the Meridienne shelter, a building by the famous architect Jean Prouvé (1901-1984), who developed not only new designs but also new ways of producing new buildings. Do you have any details on the Prouvé Bldg?